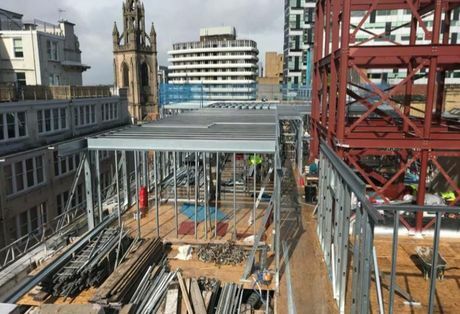 The rooftop extension is still under construction with the; steel frames, roof decking framework, lift and stair core steel frame, fire protection and steel floor joints have all been completed. The installation of the hoist has enabled access for materials, meaning internal partitioning and structural partitions are approximately 25% complete. For more information on the construction progress of Reliance House email enquiries@hopwoodhouse.com or call +44 (0) 161 337 3890.